Business leaders throughout the United States face significant challenges in today's economic climate. They must balance managing the growth and development of their human capital with the needs and expectations of the marketplace. One factor that they might not be thinking about is the cost of lost productivity due to caregiving responsibilities among their employees. Caregivers often have limited resources in the workplace to support them. According to Gallup research sponsored by Pfizer/ReACT (Respect A Caregiver's Time), more than one in six Americans who have a full-time or part-time job report that they also assist with care for an elderly or disabled family member, relative, or friend. Not only is caregiving a reality for a substantial number of employees, but this special class of worker is forced to miss an average of 6.6 days of work per year because of caregiving responsibilities. Gallup estimates that the cost of lost productivity due to absenteeism among full-time working caregivers is more than $25 billion annually. This estimate climbs above $28 billion when part-time caregivers are included. Many people might be surprised that an estimated 17% of American workers are caregivers, or about one in six. But what may surprise them more is that 46% of those caregivers are men. Gallup's analysis indicates that 20% of all female and 16% of all male workers in the U.S. are caregivers. And at least 13% of full-time workers in every major socioeconomic and demographic group are caregivers; this includes 17% of whites, 21% of blacks, and 20% of Hispanics. About one in five (22%) middle-aged American workers report being caregivers -- the highest percentage of any group. The lowest percentage across the various groups who report being caregivers is 18- to 29-year-olds, at 13%. Though the percentage of caregivers tends to decrease somewhat as education and income increase, 15% of working Americans with a college degree or who make at least $90,000 per year are caregivers. Gallup analysis indicates that employers and managers tend to be more aware of caregiving responsibilities among workers when the company is smaller, when the caregiver lives with the person whom he or she provides care for, and when the employee has at least three years of tenure in the company. Employers and managers are less likely to know about or notice caregiving responsibilities of newer employees in large companies. Caregivers in the U.S. workforce often have limited resources in the workplace to support their caregiving responsibilities. While about two-thirds have paid or unpaid vacation time they can use for caregiving and more than half can use paid or unpaid sick leave for caregiving, offerings trail off quickly beyond that. Fewer than half of caregivers, for example, can use flex time to make up lost work time or employee assistance programs to discuss emotional distress. Only 27% of working caregivers can gain access through their workplace to a support group or to health counselors with expertise about the condition of the person receiving care. And about one in five caregivers have access to financial or legal advisors or to counselors for assisted living and nursing homes. A close look at the impact that various employee offerings can have on reducing absenteeism in the workplace reveals that not all caregiver support programs are equally effective. Though all offerings are associated with lower absenteeism, some have a greater effect. Caregiver employees who work for organizations that provide counselors to discuss options for assisted living and nursing homes, for instance, miss 1.2 fewer days over the course of the year on average than those who don't have this benefit available to them. And workplaces that offer employees access to networks of support groups miss 1.1 fewer days per year on average. Effective company programs can significantly reduce absenteeism. No single program can make a major impact in reducing absenteeism, but the effect these programs can have collectively on reducing absenteeism is significant. Just 13% of caregivers who work full time are offered at least 8 of the 10 benefits listed in the graphic above at their workplaces. For these caregivers, however, absenteeism amounts to just five days per year. In comparison, among the 14% of working caregivers who are offered one or none of these options, absenteeism is 64% higher. 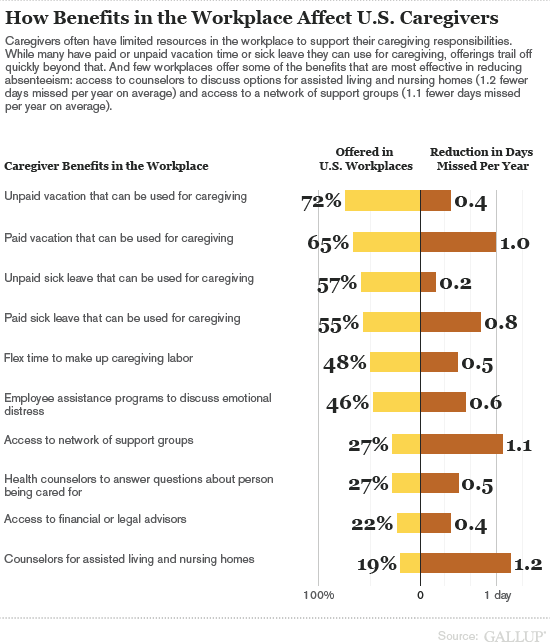 If all employers increased their available offerings to at least 8 of these 10 caregiver benefits, the cost of absenteeism for working caregivers could be reduced by an estimated $5.8 billion, or a 23% overall reduction from current levels. Though instituting these benefits is not free, the good news for U.S. employers is that most of these options would require fairly minimal capital investment to implement and maintain over time. The interventions with the greatest potential impact for employees vary according to the size of the business: Support offerings that matter most to caregivers who work for large employers differ from those that matter most to caregiver employees in small and medium-sized businesses. For example, caregivers who work for large businesses report that they get the most benefit from counselors who can help them with assisted living and nursing home options. Caregiver employees in small businesses, on the other hand, are best served by access to relevant support networks. Being aware of the programs that are most important to their employees is a smart strategy for leaders of all businesses -- large and small. Support offerings that matter most to caregivers who work for large employers differ from those that matter most to caregiver employees in small and medium-sized businesses. Being aware of the programs that are most important to their employees is a smart strategy for leaders of all businesses -- large and small. Results are based on 3,409 telephone interviews conducted by Gallup with previously identified caregivers, aged 18 and older, living in all 50 U.S. states and the District of Columbia, selected using random-digit-dial sampling. Of this sample of respondents, 2,805 were working at least 15 hours each week, and 2,523 were working full time. For results based on the total sample of caregivers, one can say with 95% confidence that the maximum margin of sampling error is ±2 percentage points. For smaller groups, such as full-time employed caregivers, the maximum error range is ±2.3 percentage points. Interviews are conducted with respondents on landline and cellular phones. Interviews are conducted in Spanish for respondents who are primarily Spanish-speaking. Samples are weighted by gender, age, race, ethnicity, education, region, adults in the household, cell phone only status, cell phone mostly status, and phone lines. Demographic weighting targets are based on the June 2010 Current Population Survey figures for the aged 18 and older non-institutionalized population living in U.S. telephone households. All reported margins of sampling error include the computed design effects for weighting and sample design. 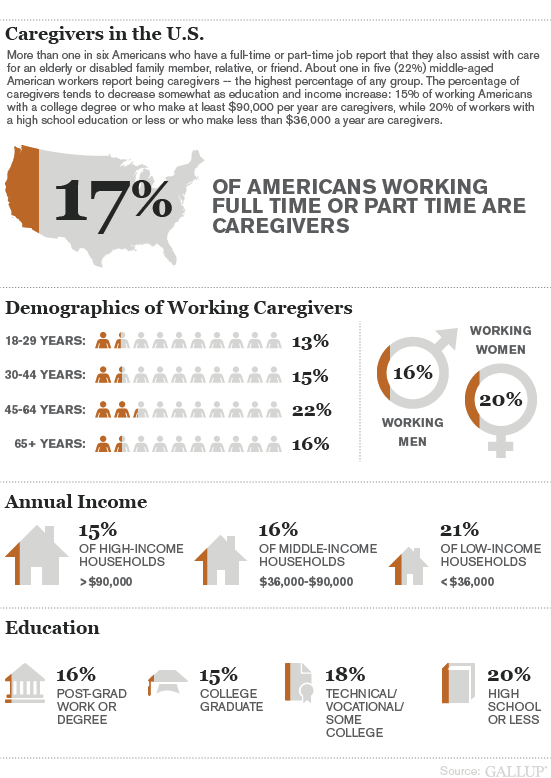 Working American caregivers report that their caregiving obligations significantly affect their work life. Caregivers who work full time miss more than 100 million workdays combined per year, resulting in $25.2 billion in lost productivity. More than one in six Americans who work a full- or part-time job also report assisting with care for an elderly or disabled family member, relative, or friend. Middle-aged, low-income, black, and Hispanic Americans are among the most likely to be caregivers.